José Carlos Teixeira’s research-based work consists of video-essays, installations and photography. His interdisciplinary practice is shaped by 3 main axes : art and politics, art and community, art and technology. Notions of identity, otherness, language, boundary, exile and displacement, are recurrent themes of interest. Through strategies of documentation, performance and collaboration, Teixeira addresses specific issues related to locational identity, global diaspora, the limits (or overlapping) of personal and social territories, and the definition of physical and psychological space. His approach is discursive and contextual, and operates as a permanent inquiry.Teixeira focuses on participation, incorporating multiple voices into the audiovisual projects. The relationship with, and the representation of Otherness (both in its external and internal dimensions) occupy a central role in his aesthetic and ethic materializations. Sarah FitzSimons is a visual artist whose project-based work typically involves a sculpture, installed outdoors or indoors, which interacts with and derives meaning from its surroundings. She interprets and reframes this process through photography, video, and storytelling, sometimes representing the images, video loops, and text as separate pieces. Much of the work seeks to connect our constructed culture and daily lives with the wider patterns of nature. A core question that drives her research is: how can an object affect the space around it? Over the past decade and into the foreseeable future, her practice continues to explore the physical presence and power of mountains, rivers, deserts, and oceans, and their counterparts, just as massive, in the individual human psyche and collective unconscious. Sarah FitzSimons (b. 1977 USA) holds an MFA in Sculpture from the University of California Los Angeles, and has exhibited her work internationally and in cities across the United States. Recent exhibitions and commissioned works include International Forest Art Path (Darmstadt, Germany); Ponto e Coordinada (Monsaraz, Portugal); The Hairy Blob (Hyde Park Art Center, Chicago IL); Compendium (Chazen Museum of Art, Madison WI); Any Questions? 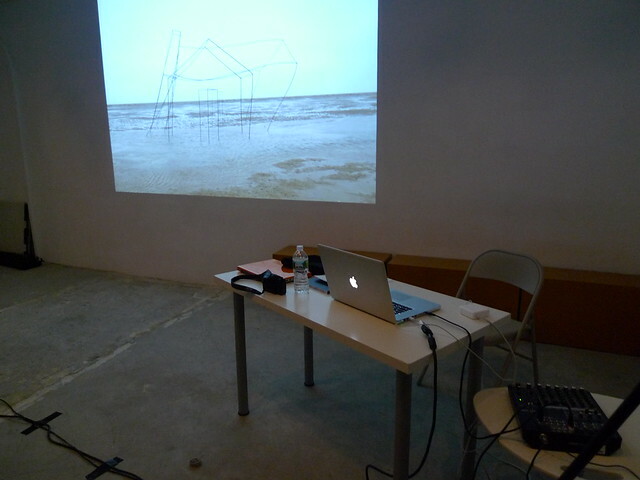 (Vadehavsfestival, Mando Denmark); Between Document and Fiction (Porto, Portugal); and Internal Compasses (Spaces Gallery, Cleveland OH). FitzSimons has received grants and fellowships from the Ohio Arts Council, University of California Los Angeles, University of Wisconsin-Madison, Vermont Studio Center, I-Park Residency, and the MacDowell Colony, among other institutions. She currently teaches as Assistant Professor of Sculpture at the University of Wisconsin-Madison. Founded in April 2011, Arte Institute is an independent non-for profit organization, based in New York. It dynamizes the production and showcasing of international contemporary artists and art projects, with a focus on Portuguese contemporary art, through the organization of events in Europe, North and South America, in a dynamic Atlantic triangle.